Amazingly, for the third year in a row, this game still features the same 14 PGA tour pros, but EA has somehow managed to fit 5 courses onto the disc instead of the two courses included with the previous installments. PGA Tour 98 features the world famous Pebble Beach, TPC at Sawgrass (again), the Colonial Country Club in Fort Worth which is home to a non-major PGA tournament, the Bay Hill Club in Orlando which is home to the Arnold Palmer Invitational, and TPC of Scottsdale located in Arizona, home to an annual PGA open tournament. While not the meat and potatoes of the game, the menu system and presentation of the 98 edition is considerably more polished than the previous installments which really helps the game feel more “next gen”. 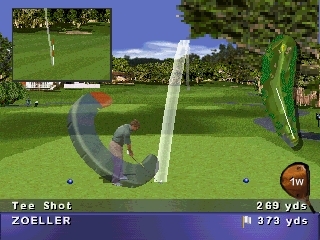 PGA Tour 98 features the same digitized player animations as the previous games, but uses a combination of techniques from the previous two titles in displaying the scenery. The foreground scenery is hand drawn as it was in PGA Tour 96, while the distant background appears to have been created with digitized photos much like the 97 edition. While these pre-rendered screens are a departure from the polygonal environments ubiquitous in 32-bit sports titles, they look clean and detailed while polygons can tend to make things look blocky if not properly utilized. The game still uses a small pop-up window to display a reverse-angle shot showing the back end of the target arc while aiming your shot, but instead of using the same window to show the arrival of your ball, the main view switches to the area of the course where your ball is going to land after you hit it. This makes the game feel more like a television broadcast, but the game loads the data before the ball is hit causing an irritating several-second delay between the completion of the 3-click swing and the swing itself. EA still hasn’t messed with the solid core gameplay, but it would have been nice to see EA do something new to keep the series fresh. If you’re a fan of the series then the 4 new courses included on this disc are sure to keep you busy for awhile, but things are starting to feel a bit stale. Buy PGA Tour 98 on GameGavel or Amazon. Tagged EA, Golf, PGA, PGA Tour 98, Playstation, PSX, Review, Sony, Sports. Bookmark the permalink.